As people rushed to cast ballots before the end of the day, officials in Virginia, Maryland and the District of Columbia report no major issues at polling stations. WASHINGTON – As the race to the White House continued to heat up, voters braved long lines and minor glitches at polling stations throughout the region. Residents interviewed by WTOP waited anywhere from 30 minutes to four hours to cast their ballots. Despite the lines, most people agreed it was worth the delay. Hours after polls closed, some voters in the Old Dominion stayed in line waiting to cast their ballots. Some had already been waiting up to four hours, reported WTOP’s Kathy Stewart. Virginia election officials estimated that turnout might exceed the 2008 presidential election. They urged voters not to give up and continue to wait, even though some could be standing in line until the early morning. “We’re handling it as best we possibly can, but logistically we can only process so many with six machines,” said Gaston Gianni, chief election officer for the River Oak Precinct. State Board of Elections Secretary Donald Palmer said robust turnout led to long lines at polling places across the state. Officials said they worked with localities to bring in more voting equipment and staff to help ease lines at polls that opened at 6 a.m.
@wtop Three hour waits in Prince William.Why do 3rd world nations even have better voting systems than we do? Awful. 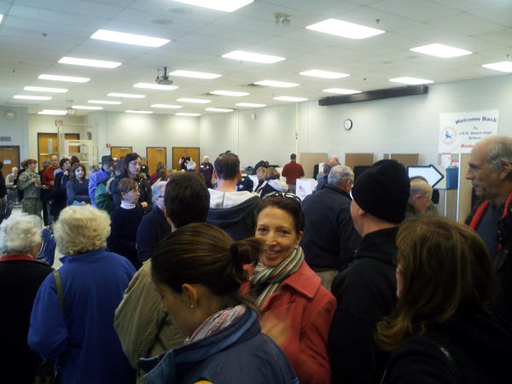 WTOP received calls from voters all over northern Virginia complaining of long lines. In Prince William County, higher turnout than expected meant there was one voting machine for every 750 voters, which is in compliance with Virginia state code. “This is a bigger turnout that we expected…we’re doing the best we can,” said Betty Weimer, Prince William County voter registrar. Palmer said there were very few issues at the about 2,400 polling places statewide, ranging from problems with electronic voting equipment, power outages and polls opening late. Voters also complained some polling places appeared to have an insufficient number of voting machines. WTOP received several phone calls from voters in the Fredericksburg area about problems at Lee Hill Elementary School and the Lee Hill Community Center. At Lee Hill Elementary School in Fredericksburg, early voters told WTOP all of the electronic voting machines were broken and that polling workers only had 50 paper ballots available. Callers said hundreds of people have been turned away. The Freelance-Star reported the problems were resolved by around 8 a.m.
An election official says the school only had a voting machine for the 1st Congressional District. Election official John Adams tells The Freelance-Star it was “human error.” The school should have had machines for the 1st and 7th districts. A Maryland woman emailed WTOP to say that she waited from 7:15 a.m. to 10:15 to cast her ballot at the Rolling Crest Community Center in Hyattsville, Md. She was told the voting center didn’t have enough electronic voter cards, which are used to cast ballots. Donna Duncan, director of the Maryland State Board of Elections, told WTOP she was not aware of any widespread problems at the polls. She noted that state law requires one voting machine for every 200 voters at a precinct. Each precinct should have five voter cards per machine. Presidential elections always draw more voters, Duncan said. She expected turnout to be close to 80 percent of registered voters. Despite a relatively calm day, D.C. police responded to two incidents at polling precincts Tuesday. An advisory neighborhood commission candidate was arrested after allegedly tackling a person she believed was taking down one of her signs. She was charged with assault. And two students at Shaw Middle School were apprehended for throwing books and liquid onto voters from a second floor window. PROBLEM: Pct 77 scanner out of svc. Pct capt said give ballot to him “don’t worry I’ll make sure it’s counted”. No private ballot. The ballot was handed to a precinct captain, who then added it to a stack of ballots that were easily visible, according to @mattashburn. “Dunno if it’ll count, since scanner down & I didn’t see it scan,” @mattashburn later Tweeted. Most D.C. precincts had two or three booths each and one or two electronic voting machines. Voters then had to wait in line at one scanner per precinct to have their ballot scanned. In addition to malfunctioning equipment, some poll workers failed to show up to work on Tuesday morning. The D.C. Board of Elections said it is working to address the issue. Some voters received a robocall Tuesday from the D.C. Democratic Party saying to vote Wednesday, but party leaders say it was just a glitch. Tania Jackson with the D.C. Democratic State Committee told WTOP they sent out a robocall to 100,000 people Monday. Some people got the message Tuesday instead, she says. The DSC re-recorded the robocall for 1,700 people giving them the correct information, Jackson said. In Georgetown, students stood in a 90-minute line for same day registration. WTOP’s Mark Segraves reported that ballot boxes in Precinct 6 were overflowing as polls prepared to close. Tell WTOP what you are seeing at the polls, tweet using #WTOPVote.